Buongiorno Giorgio! This is wonderful news! Nr 2 would according to my comparisons be the right one! If you also have one of the small round bricks ho hold the wire in place (i guess), that would truly be awesome! I'll send a PM with all the details! Ciao! This AR-forum is truly awesome! Thank you AR55 and to whomever puts stuff in the library: The above pdf should be archived. I'm afraid that the widespread appreciation for music has in fact been diminishing. Fewer are interested in music with "musicality", with respect for form and rules, with a sense of purpose. We involuntarily bear witness to a prevailing preference for profit and/or fame over the music and its substance and meaning. And I fear that this phenomenon, which we have been witness to over the past few decades, extends to much more than just music. There is simply too much commercialization and not enough interest in the art form and its significance to our very existence. This has led to the parallel diminishing appreciation for the ways, or methods, if you prefer, in which music is reproduced. Therefore the lack of interest in "vintage" stereo equipment from the 1950s, 1960s and 1970s, which many as well as myself consider the "golden age" of music and of its reproduction. I do not condemn the current younger generation for its lack of appreciation of this most noble of art forms and its proper reproduction. They have been raised to place an inordinate value on technology in every form, rather than to strive for the use of technology to truly improve all aspects of our lives. Regrettably, I believe our current society has strayed from those boundaries which provide for the sense of balance which we as humans need so very much in order to excel and be content. Although this saddens me as well, especially considering the wealth and technological accomplishments of our current society, I retain the faith and conviction that this, too, is but a cycle, however long in duration, which will pass. It has always been so during the course of our civilized existence. As in the past, there will always be the minority which appreciates and preserves these accomplishments of our civilization out of appreciation and devotion, and this minority in fact becomes the caretaker for the future generations which will inevitably follow us and seek to rediscover what we have been so fortunate to have experienced. And hopefully create even more beauty through music and through its reproduction. Personally, I accept this reality. Furthermore, I feel deep satisfaction and a sense of comfort that we exist. That we are more in numbers than we realize. And that ours is both a pleasurable and noble endeavor. I would not have it any other way. Live every day nurturing your souls with music, played the right way, my fellow travelers..... Greetings from Athens. Thank you all for the good inputs! Today I bit the bullet and made the orders to continue my restoration. This included: €35 Foam surrounds and glue from Goodhifi.com $55 Fabric 18 count lambswool from 123Stitch.com £10 0.07mH Jantzen Air Core Wire Coil AWG18 from hificollective.co.uk €73 HiVi Q1R 1-1/8" Textile Dome Tweeter Q1R from soundimports.eu One thing I'm currently missing is 1 terminal nut... Maybe someone have one to spare? @ra.ra About 4xa I wrote "someway unlucky". And IMO it was, I agree with you about strategies of AR for this model. Personally I prefer the sound of 4x: more smooth and natural human voices. I don't want criticize the Allison's tweeter, actually a beautiful one. About the 6 different performances: even if I do understand that nowadays can be nice comparing and listening different versions, I judge somewhat uncorrect from a serious speaker-maker selling different products with the same name. IHMO the presence of a glue ring is a normal consequence of assembling procedures, partially automatized. Thickness of the paper of cone from coil to edge normally decrease, and there is no practical need of an heavier edge. Instead, it's desiderable a lighter one, to prevent dynamic shock of the cone surface, and breaking-up phenomena. You can get Lacquer Thinner at Home Depot. $100 for a pair of AR-3a's in even fair condition is a steal! Congratulations! Since you're in Europe and shipping can be expensive, I think your plan to use the Hi-Vi (are they Swan over there?) tweets and just hold onto the originals makes sense. There are instructions somewhere in these pages on how to hook them up with the proper inductor. That 18-count "lambswool" linen we buy from 123 Stitch is made by Wichelt and may be available on your side of the pond. Maybe you'd want to let us know the "long list" of things you're ordering from Vintage AR. Larry is an honest seller and he knows his stuff but some of what he sells are off-the-shelf items you may be able to find within the EU at a lower cost. Just a thought. Thanks for the input from all of you. I have indeed downloaded the guide - it's excellent and I'm currently following it for troubleshooting. Since the basses where out of surrounds I didn't have the guts to plug them in just yet. The pair have never been repaired before (at least in my opinion) and I do want to keep them original if possible - but maybe not at whatever cost (I've never heard a pair of AR's before). Since I live in Sweden postage is another factor to add to the account. I already have a long list of things that I'm planning to order from vintage-AR (Ebay). I really don't know how much I can spend to break even if I decide to sell them in the future. On hifishark they are listed for $800-1300. I paid around $100 for them and they are in good cosmetic condition but could need some new grille-cloth and a light refinish with some 600 grit paper and boiled linseed oil. The Hi-Vi options sounds tempting for a start - I can even find the tweeters here in EU for about €30 /piece. I can always keep the originals and maybe restore them later or if I sell them I can send them with the speakers for good measure. So many options! I hope that the AR3a could be a good replacement for my Sonab OA-14 (Swedish speaker) and/or DCM QED's (American - so i guess you guys know about them). The funny thing is that nor AR's or DCM speakers are that common in Sweden, I really don't know why I'm all of a sudden have two pairs of American speakers As a EU Citizen i really thought I was going for the Tannoys - I guess that have to wait a couple of years! I'm really looking forward to the restoration - i just love bring old good craftsmanship back to life and (sort of) save the planet. Thanks for the info Roy, I'll contact Chris. Would you avoid using them at all until fixed or could I try them out on low volume just to se in the make any sound? To answer the above question, the 22 and 24, plus the 26 are identical and use an 8" woofer and 3.5" paper cone tweeter. (So too did the Model 25 console stereo.) The 17 uses a 10" woofer and a phenolic tweeter. Basically, they're all Model 22s. The 22s were offered as standalone speakers, while the 24s and 26 were the exact same speaker when included with the model 24 and 26 all-in-one systems. 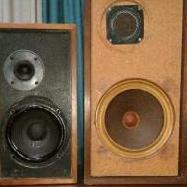 The 22s and 24s had conventional binding posts for speaker attachment, whereas the 24 Series II and 26 used RCAs. KLH used three different crossover designs for these. Some used the crossover in Angelo's photo above, others used the type shown in JKent's post and the third type is shown in the photo below. So far I've been unable to figure out date/model points for when the crossovers were updated/changed.